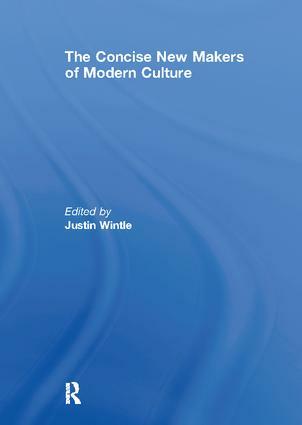 Containing four hundred essay-style entries, and covering the period from 1850 to the present, The Concise New Makers of Modern Culture includes artists, writers, dramatists, architects, philosophers, anthropologists, scientists, sociologists, major political figures, composers, film-makers and many other culturally significant individuals and is thoroughly international in its purview. Next to Karl Marx is Bob Marley, with John Ruskin is Salman Rushdie, alongside Darwin is Luigi Dallapiccola, Deng Xiaoping rubs shoulders with Jacques Derrida as do Julia Kristeva and Kropotkin. With its global reach, The Concise New Makers of Modern Culture provides a multi-voiced witness of the contemporary thinking world. The entries carry short bibliographies and there is thorough cross-referencing as well as an index of names and key terms.